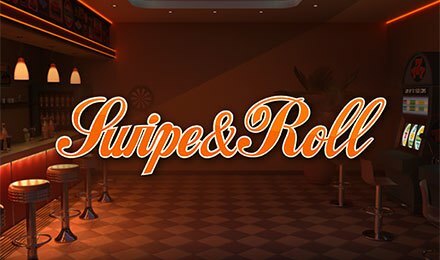 A classic setting is awaiting you on Swipe and Roll Slot powered by NetEnt. It is a 5-reel, 20-payline game available at Wicked Jackpots. On its backdrop, you can see a vintage café, a bar and some new slot machines. It is all reminiscent of the traditional slot games which started to become popular many years ago. As for the reels, they are full of classic symbols like Oranges, Watermelons, Plums, A, K and Q. Load the game up at Wicked Jackpots using a computer, mobile phone or iPad! Make use of the Plus and Minus signs on the Coin Value and Level fields to adjust your stake on Swipe and Roll Slot. Do you wish to place the highest bet in one click? Simply hit the Max Bet tab. After setting up all your preferences, click on the Spin button. If you want to speed up, click on “Auto Play” to set a number of games that are consecutively played. Bet Levels: Choose a maximum of 10 bet levels. Amount of Paylines Selection: The 20 paylines are active throughout your entire gameplay. Coin Values: Find the following coin values on this game: 0.01, 0.02, 0.05, 0.10, 0.20 and 0.50. During the base game and Wild Re-spins feature on Swipe and Roll Slot, the wild Diamond lands on any reel. As for the x3 Wild, it shows up only on reels 2, 3 and 4. Both replace any symbol except Scatter and other Wilds to form a winning combination. With the presence of a x3 Wild, the payout is also tripled. The Bell symbol stands for Scatter and can trigger the Wild Re-spins feature, as well as the Bonus Round. With at least 3 Wild symbols anywhere during the main game, the Wild Re-Spin Feature becomes active on Swipe and Roll Slot. The Wilds are then locked in the same position for a free re-spin. Activate the Coin Wheel Feature at random on Swipe and Roll Slot during the main game. The Coin Wheel consists of coin wins, Arrows and Scatters. The Arrows expand the win zone to allow for higher prizes. If you land a Scatter during the feature, you can trigger the Bonus Round. Three Scatters on reels 2, 3 and 4 during the main game and Wild Re-spins trigger the Bonus Round. Simply swipe the 3 wheels in any order to earn coin wins or Arrows. Take delight in playing Swipe and Roll Slot at Wicked Jackpots and be ready for hours of entertainment. Good luck to you!